Sunday was a great defining moment for the Super Bowl XLVIII with the San Diego Chargers and the San Francisco 49ers coming out victorious. San Diego Chargers was fired up as they disposed of Cincinnati Bengals under the cold, rainy afternoon at the Paul Brown Stadium last Sunday. Fans should prepare themselves for a bout between Chargers’ Rivers and Denver Broncos Peyton Manning on January 12 4:40 p.m. ET. San Diego almost didn’t make it to the American Football Conference wild card round, but on Sunday they gave the Bengals their first home defeat for the entire year 27 – 10 making them a Super Bowl contender to watch out for. Last month, the Chargers’ chance for the playoffs was gloomy with a record of 5-7, which could easily be their fourth consecutive year out of the postseason. But after five victories the Chargers were able to defeat the Super Bowl XLVI champion, the New York Giant. Their win last Sunday will send them straight to Denver and face Broncos’ formidable Manning as the team goes against each other next weekend. Their win against the Giants definitely boosted their confidence to take on the Broncos. Even Chargers’ safety Eric Weddle said they have complete faith in what they are doing and that they peak at the right time. He added that the team has been playing with the playoff game's energy ever since they play against Kansas City in week 12. And last Sunday, they won the real deal. But they weren’t dazzling, Rivers was even quiet. He went for 12-for-18 for only 128 yards. He got a lot of support coming from a balanced attack though. San Diego had a 196 yard rush. The team’s defense took advantage of all the mistakes done Bengals’ quarterback Andy Dalton. Rivers was also very confident that it was Chargers ball. He said he just has to complete all the passes that were presented, and then complete some big passes, then he just “run it.” He said that playoff games aren’t supposed to be pretty. It was Ronnie Brown’s 58-yard TD during the last 2:17 left in the game that defined Chargers’ victory, even though the game looked like it was already won by the Chargers’ long before that. During the half time, Bengals was leading with 10-7. Bengals has never been defeated at their home, but Rivers turned the game around. He only threw six passes during the first half of the game. That performance was a little conservative as admitted by Rivers. But on the third quarter, he was easily able to complete six passes. Finally, it was a wonderfully thrown fade to Chargers tight end Ladarius Green who was in the end zone, which gave San Diego a 10-play, as well as a 80-yard drive and ultimately a 14-10 edge. Andy Dalton was disastrous in the second half. All that the Chargers ever needed was for Bengals’ Dalton to mess things up. Dalton lost the ball in one of his first down attempts. He also threw interceptions in some of the possessions. But the Chargers played efficient football. Now, they are confident enough to face the juggernaut Denver Broncos. The cold wind was blowing in Green Bay and less than five minutes left in the game, when San Francisco 49ers quarterback Colin Kaepernick went for a third-and-10 for a 31-yard yard line on his own. This is what quarterbacks are all about. Kaepernick was great as he stepped up in the pocket, avoiding a blitz and then he delivered a 17-yard dart to Michael Crabtree. Nine wonderful plays and later on, one key run by Kaepernick lead the 49ers back for the third straight time to the Divisional Round. 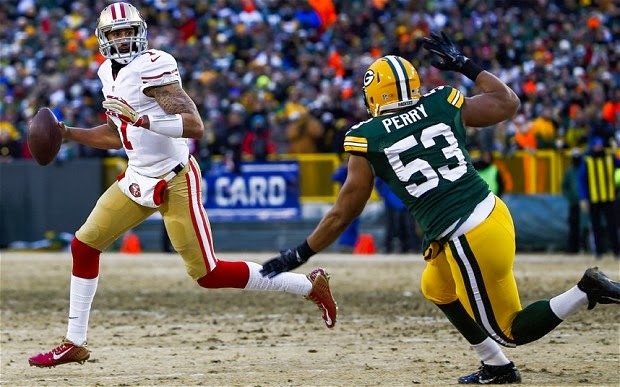 The 49ers defeated the Packers 23-20 in one of the best games and on an incredible weekend in Football. On Sunday, 49ers will play against the Carolina Panthers. Old school style of running with both teams running backs, Frank Gore and Eddie Lacy are mixed with new school style at quarterback. It was definitely one of the most exciting games in the playoffs. With an exchange of excellent throws coming from escape artists quarterbacks. Though the Packers lost, the team played one hell of a game. They fell short because early in the game they lost cornerback Sam Shields and linebacker Mike Neal who got injured. The game almost went overtime when Packers’ cornerback Davon House went in to block Phil Dawson 33-yard field goal, which was the play won the game. Unfortunately for House, the ball went straight through his arms, and was called offside. That was a wonderful way for Packers to exit the season, especially that they seem unlucky way before November when Aaron Rogers was injured with a broken collarbone. On that Sunday against the 49ers, Rodgers played fairly well, however, it was difficult for him to throw the ball for the quarterbacks. Their offensive wasn’t that impressive. Rodgers made up for the problems of the Packers. The defensive was also great, but they slacked off in the fourth quarter. The team’s safety was struggling. They lost Vernon Davis, who made a 28-yard TD, ad the Packers weren’t able to handle Kaepernick, just like what happened last year. The Packers always make it to the postseason and are great contenders for the Super Bowl. However, their defense is growing worse. They should decide quickly whether or not defensive coordinator Dom Capers is the best man to lead them to a better defense. NFC has plenty of great quarterback talents. Next week, there will be three young excellent quarterbacks who will play, including Drew Brees. Kaepernick was superb in last Sunday’s game, he proved that he really do belong to the team, especially with the team’s powerful defense and a great running game. What the 49ers did in last Sunday’s game shows potential that they could come back to play at the Super Bowl XLVIII on February 2 at the MetLife Stadium East Rutherford, New Jersey.